If you’re sniffling and sneezing your way through allergy season, adding the right air filter to your HVAC system can help improve your home’s air quality and ease your allergy symptoms. But deciding which filter to choose can be just as tricky as finding the right allergy medicine. Here’s what you need to know before you go shopping. These are the flat-panel filters that have been around for years. They don’t look fancy, but they’re affordable and won’t restrict airflow in your HVAC system as much as the others. However, they’re not great at trapping allergens. These filters will capture less than 10% of the pollutants in your home. But if you’re allergies aren’t terrible, it’s a small investment to give these a try first. The pleated filters have a lot more surface area and will filter 45% of allergens in your home — including pollen, dust mites and pet dander. You can even find electrostatic filters made with electrically charged materials that are great at attracting particles. The downside is they’re a little bit more expensive and can restrict airflow in your HVAC system. This means your system will have to work harder and it’ll be hard to save money on energy costs during allergy season. But test one out and see if the thicker filter changes the way your heating and cooling system works. These filters are so good that they remove up to 98% of pollutants in the air, but they’re also so thick that they require an extra fan to push air through the filter. That’s why HEPA filters have to be incorporated into a whole-house filtration system, like the Trane CleanEffects™ Air Cleaner. Filtration systems like this can trap particles down to .1 micron in size. And while these filters have the highest cost, they also the biggest impact on improving allergy symptoms. 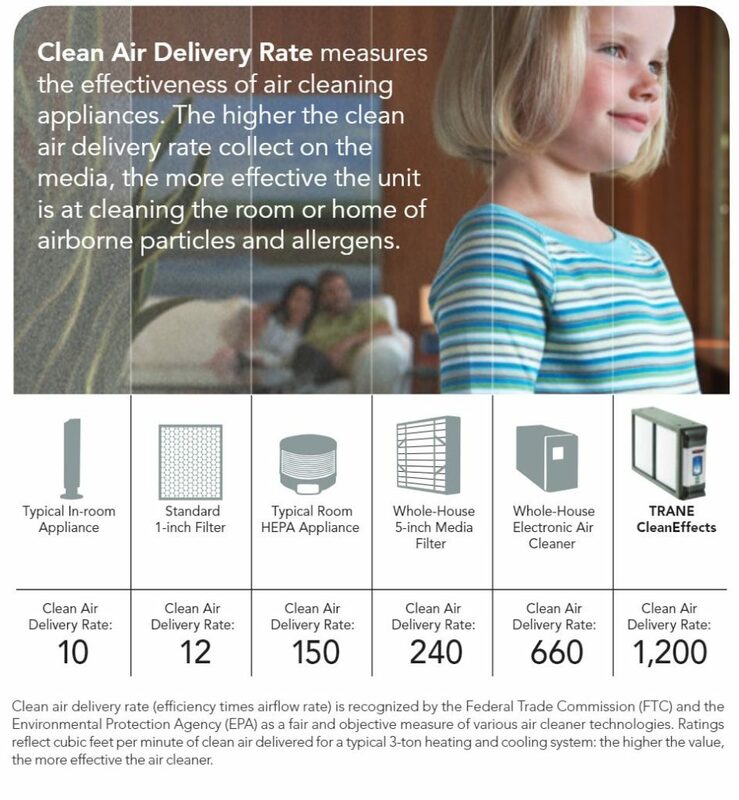 Before you make your final decision, compare the Clean Air Delivery Rate (CADR) of common filter types. You may pay a little more for a higher CADR, but your sinuses will thank you. Finally, keep in mind that an air filter is just one part of your allergy battle plan. You’ll have a better chance of wiping out allergies if you use multiple tactics. Try adding some of these simple tips into your routine. Keep pets off of furniture and out of bedrooms. If your pets are outside often, allergens will stick to their fur and they’ll bring those particles indoors with them. Shower before you go to bed to remove any allergens that are on your hair and skin. Wash clothing and linens with super hot water to banish dust mites. Vacuum, vacuum, vacuum. A fast way to reduce sniffle-inducing dust and allergens is to vacuum once a day. Keep your windows closed and limit your time outdoors to reduce exposure to pollen and outdoor allergens. Consider a whole-house filtration system for a more robust approach to stopping allergy attacks. THE BOTTOM LINE: Every allergy sufferer and HVAC system is unique, so you’ll need to see how different filters affect your allergy symptoms and your heating and cooling system’s operation. A little trial and error will help you find the perfect filter for your home (and your nose). If you want one-on-one advice about the best filter for your home or you’re curious about whole-house filtration, your local Trane Comfort Specialist™ can walk you through a variety of options to help handle your allergies.